The internet is a global network that connects millions of computers and thereby, making it a fastest and the easiest mode of communication. According to internet world statistics, as of July 2013, the estimated number of internet users were found to be 2,712,239,573 worldwide as a result of which it is seen as the world's largest technology podium. Internet has undoubtedly, made this world a luxurious place to live in but at the same time, it possesses a threat or a negative impact too, one of which being internet addiction. Kimberly Young described internet addiction as an impulse-control disorder that does not involve an intoxicant. Every individual has different internet habits. Some might be compelled to use internet copiously for their work while some might be totally dependent on the social networking sites just to be in touch with family and friends far off. The use of internet only gets problematic when it starts interfering with ones professional life, personal relationships, and other activities of daily living. Various research studies conducted worldwide have proved that youth are heavy users of newer electronic communication forms. A study conducted on the digital lives of generation Z (people born between 1994 and 2004) reported around 58% of generation Z now inclined to give up watching TV in favor of browsing internet on a mobile phone. Studies have further suggested that excessive use of internet lay a major negative impact on the psychological status of the youth who are in the crucial developmental phase of their life. Goel et al. reported that the prevalence of internet addiction among adolescents was 0.7%. Several studies have also indicated that there is a significant relationship between internet addiction and factors such as depression, anxiety, and stress.,, A similar study on internet addiction reported internet use to have a negative affect on ones social involvement and psychological well-being. Kathai and Singh identified the fact that social isolation fosters internet addiction. Parental bonding also had a significant impact on internet addiction as it was identified that the youngsters those who were constantly receiving an emotional support from the parents, had lesser involvement with internet. A study conducted by Andreou and Svoli revealed that participants who have control over their lives were less likely to be addicted to the internet. India is considered the 3rd largest internet users base in the world with 2 million users. According to world population statistics 2013, the population of youth in India is about 361.2 million, Since internet addiction is increasing at an alarming trend among the younger generation laying a significant impact on their mental health, it appears to be a major public health concern for the Nation. These reports spurred the need to undertake this study and to estimate the prevalence of internet addiction and identify its associated factors. A cross-sectional study design was adopted and the study was undertaken among undergraduate college students in Udupi Taluk between February and June 2015. The sample size was calculated based on the result of a pilot study conducted among 40 undergraduate college students. According to the pilot study, the prevalence rate of internet addiction was 4%. Assuming 10% as an expected prevalence, 20% as relative precision and 1.5% as design effect, the total sample size calculated was 1296. A two-stage cluster sampling technique was employed. At the first stage, out of 19 undergraduate degree colleges, eleven colleges were selected using simple random sampling (lottery method). This was followed by the second stage, where a fixed number of 120 students were selected from each college to reach the required sample size. Students who do not use internet and who were absent in the class during the time of data collection were excluded from the study. The Ethical clearance for the study was received and permission was obtained from all selected undergraduate degree colleges in Udupi Taluk. Participation in the study was voluntary and written informed consent was obtained from all the participants after the purpose of the study was explained to them using a predefined subject information sheet. Data were analyzed using SPSS 15 version (SPSS Inc., Chicago, IL). Descriptive statistics were reported for all the variables and Chi-square test was used to signify the associated factors. P < 0.05 was considered as statistically significant. A self-administered standard questionnaire was used in the study for the purpose of data collection. The questionnaire was administered both in English and local language (Kannada). Depression, anxiety, and stress scale (DASS21): The DASS is a 21-item self-report questionnaire that provides scores on three subscales, depression (7 items), anxiety (7 items), and stress (7 items). Each item is scored from 0 (did not apply to me at all) to 3 (applied to me very much or most of the time. In completion of DASS, the respondents are required to indicate the presence of symptoms over the past week. The final sample included in the study was 1304. Out of these, 716 (54.9%) were females and 588 (45.1%) were males. The mean age of the participants was 19.16 years. The SPSS 16.0 version was used for the analysis of the data, and the overall prevalence of internet addiction was 44%. Among 1304 participants, 733 (56%) were normal users, 358 (27.5%) had mild addiction, 206 (15.8%) had moderate addiction whereas 7 (0.5%) were indicated as severe addicts. The study revealed that males were more addicted to the internet than females. Internet addiction was significantly associated with factors such as availability of own personal gadgets (P < 0.001), use of smartphone (P < 0.001), exposure to internet at a very young age, internet usage for the purpose of exploring new things and building new relationships online and frequency of internet usage for more than 2–3 h/day [Table 1]. 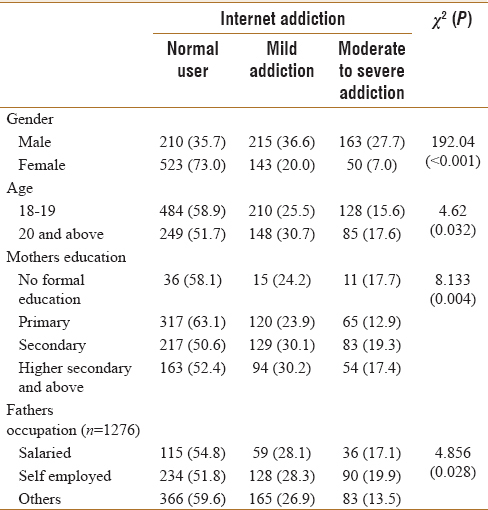 Interestingly, the study also identified a significant association of internet addiction with mother's education and father's occupation [Table 1]. Using DASS21 scale (depression, anxiety, and stress), it was found that with increase in internet addiction there was a subsequent increase in the level of depression, anxiety, and stress [Table 2], [Table 3], [Table 4]. The major purpose of the study was to estimate the prevalence of internet addiction among youth in Udupi Taluk and identify its associated factors. The prevalence of internet addiction was 44% which is comparable with the findings of the study conducted by Vijay et al., among undergraduate college students in Salim city of South India where the prevalence of internet addiction was estimated to be 56.5%. Internationally, a study conducted by Bahrainian and Khazaee identified the prevalence of internet addiction as 40.7%. Another study conducted by Jahanian and Seifury reported the overall prevalence of internet addiction to be 44.5%. The present study identified that males were more addicted to internet than females. Consistent to these findings a study conducted by Jain et al., Vijay et al., Goel et al. (2013) also reported the same findings. This study did not identify a significant association between internet addiction and current place of stay but the study conducted by Vijay et al. revealed that majority of the students who were staying in the hostel were normal users whereas internet addiction was higher among those staying at home. Mother's education and father's occupation was also significantly associated with internet addiction as the study found that participants whose mothers had secondary and higher level of education were more addicted to internet. It may be because mothers with higher educational status may be more technology friendly and their internet habits might have influenced their children. On the other hand, participants whose fathers were either salaried or self-employed were found to have a higher level of internet addiction. Better socioeconomic status of the family may play a key role as children are more likely to enjoy all the luxury that world has to offer. Contrast to these findings, a study conducted by Asiri et al., (2013) and Krishnamurthy and Chetlapalli did not find any significant association between parents occupation and internet addiction. This study found that participants who have their own cell phone have a higher level of internet addiction as compared to those who do not use cellphone. Similar to these finding, a study conducted by Rajesh also illustrated that availability of cellphone is significantly associated with internet addiction. Use of smartphone also depicted significant association with internet addiction as the level of internet addiction was higher among those who used smartphones. These findings are comparable with a study conducted by Vijay et al., (2015) where 42.3% of mild addicts and 17.8% of moderate addicts were found to be constantly using smartphones. Sharma et al. also illustrated that participants using smartphone were more addicted to internet as compared to those who were using phones without the features of a smartphone. Most of the normal users started using internet for academic purpose (68.6%) which can be related with the study conducted by Vijay et al., (2015) as 64.9% of the participants who started using internet for academic purpose were normal users. The study also determined that longer the duration of internet use, higher the level of addiction. Rajesh and Vyjayanthi et al. also reported the similar finding. More than half of the participants (75.9%) who use internet in the daytime were normal users. A similar study conducted by Goel et al. (2013) found that participants who are addicted to internet use it mostly at night or in the evening. About the online preferences, social networking played a significant role in enhancing internet addiction as the level of internet addiction was higher among those who preferred social networking. These findings can be compared to the study conducted by Vijay et al., (2015) and Kutty and Sreeramareddy who also reported that a vast majority of the participants who were addicted to internet use it for the purpose of social networking. Internet addiction was found to be significantly associated with factors such as depression, anxiety, and stress. Increase in internet addiction led to subsequent increase in the level of depression, anxiety, and stress. A study conducted by Panicker and Sachdev and Ayas et al., also reported a significant relationship between internet addiction and depression whereas contrast to these finding a study by, Reda et al., did not find any significant association between internet addiction and depression. A study by Akin and Iskender also identified a positive correlation between internet addiction and anxiety (r = 0.63). Various national and international studies depicted significant positive association between internet addiction and anxiety.,,, In a study conducted by Chathoth et al., majority of the participants (76.4%) addicted to internet were exposed to environmental stressors. The present study depicts the prevalence of internet addiction to be 44%, and it is found to be significantly associated with various factors. Although internet technology is considered the most effective tool and one is compelled to use it for various purposes, however, every individual should be able to recognize the point where internet starts to overrule one's life and further hinders other activities of daily living. Hence, the burden of internet addiction requires a earlier intervention internet addiction is still not considered a major issue, and since addiction is progressive in nature it may highly increase with time. Since more than half of the participants included in the study had no knowledge on the impact of internet on health. It is important to organize and implement health programs addressing young people on internet and its impact on health. The study ruled out significant association between internet addiction and mental health conditions such as depression, anxiety, and stress. Therefore, there is a need to impart training to college faculty to identify the common symptoms, and student counselling sessions need to be organized every month. The study also identified that participants who access internet at home were more addicted to the internet which could be because most of them lived with their parents. However, parents need to be sensitized to monitor and limit the internet usage of their children. Since exposure to internet at young age showed comparatively higher level of internet addiction, a school-based educational programs need to be targeted to reduce addiction among adolescents. Internet Users. Internet Live Stat; 2014. Retrieved on: 1st December 2014. Available from: http://www.internetlivestats.com/internet-users/. [Last accessed on 2014 Dec 11]. Kimberly Young: Therapeutic Issues with Internet Addicted Clients. Available from: http://www.slowmind.net/slowmind_net/young2.pdf. [Last accessed on 2014 Dec 11]. 21 Percent Kids in India Hooked on to Mobile Internet. The Mobile Indian; 2012. Available from: http://www.themobileindian.com/news/9189_21-percent-Kids-in-India-hooked. [Last accessed on 2014 Dec 01]. Yadav P, Banwari G, Parmar C, Maniar R. Internet addiction and its correlates among high school students: A preliminary study from Ahmedabad, India. Asian J Psychiatr 2013;6:500-5. Akin A, Iskender M. Internet addiction and depression, anxiety and stress. IOJES 2011;3:138-48. Kraut R, Patterson M, Lundmark V, Kiesler S, Mukopadhyay T, Scherlis W, et al. Internet paradox. A social technology that reduces social involvement and psychological well-being? Am Psychol 1998;53:1017-31. Kathai GS, Singh AP. The effect of internet addiction on depression, anxiety, social isolation and sleep pattern among youth. Indian J Appl Res 2014;4:1-5. Bhagat G, Sehgal M. The relationship of parental bonding and internet addicton. Indian J Psychol Sci 2011;2:29-37. Andreou E, Svoli H. The association between internet use characteristics and dimensions of internet addiction among Greek adolescents. Int J Ment Health Addict 2013;11:139-48. Population Reference Bureau. The World's Youth 2013 Data Sheet. Available from: http://www.prb.org/pdf13/youth-data-sheet-2013.pdf. [Last accessed on 2014 Dec 10]. Paul AV, Ganapthi RC, Duraimurugan K, Abirami M, Elizabeth Reji V. Internet addiction and associated factors, a study among college students in South India. Innov J Med Health Sci 2015;5:121-5. Bahrainian A, Khazaee A. Internet addiction among students: The relation of self-esteem and depression. Bull Env Pharmacol Life Sci 2014;3:1-6. Jahanian R, Seifury Z. The impact of internet addiction on student's mental health in technical and vocational colleges in Alborz province. Middle East J Sci Res 2013;14:1533-8. Jain T, Mohan Y, Surekha S, Mouna VS, Swapna US, Swathy Y, et al. Prevalence of internet overuse among undergraduate students of a private university in South India. Int J Recent Trends Sci Technol 2014;11:301-4. Asiri S, Fallahi F, Ghanbari A, Kazemnejad-Leili E. Internet addiction and its predictors in Guilan medical sciences students, 2012. Nurs Midwifery Stud 2013;2:234-9. Krishnamurthy S, Chetlapalli SK. Internet addiction: Prevalence and risk factors: A cross-sectional study among college students in Bengaluru, the silicon valley of India. Indian J Public Health 2015;59:115-21. Rajesh K. Internet addiction and psychosomatic symptoms in engineering students. Delhi Psychiatry J 2014;17:387-94. Sharma A, Sahu R, Kasar P, Sharma R. Internet addiction among professional courses students: A study from central India. Int J Med Sci Public Health 2014;3:1-5. Vyjayanthi S, Makharam S, Afraz M, Gajrekar S. Gender differences in the prevalence and features of internet addiction among Indian college students. Med Innov 2014;3:49-53. Kutty NA, Sreeramareddy CT. A cross-sectional online survey of compulsive internet use and mental health of young adults in Malaysia. J Family Community Med 2014;21:23-8. Panicker J, Sachdev R. Relation among loneliness, depression, anxiety, stress and problematic internet use. IMPACT Int J Res Appl Nat Sci 2014;2:1-5. Ayas T, Horzum MB. Relation between depression, loneliness, self-esteem and internet addiction. Education 2013;133:283-90. Reda M, Rabie M, Mohsen N, Hassan A. Problematic internet users and psychiatric morbidity in a sample of Egyptian adolescents. Sci Res Psychol 2012;3:1-6. Seifi A, Ayati M, Fadaei M. The study of relationship between internet addiction and depression, anxiety and stress among students of Islamic Azad university of Birjand. Int J Econ Manage Soc Sci 2014;3:28-32. Chathoth V, Kodavanji B, Nayanatara AK, Pai RS. Correlation between affect and internet addiction in undergraduate students Mangalore. J Addict Res Ther 2014;5:1-4.